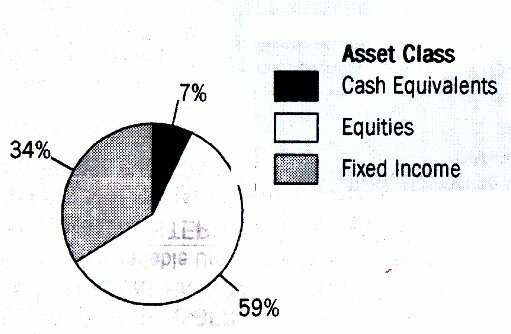 With 41% of the portfolio in cash and Fixed Income, this is the portfolio distribution of a retired 65 year old! Remember, the client is a 32 year old single male. Now, let’s look in more detail at the composition of the portfolio. Eighteen Thousand dollars ($18,000, 25%) are invested in the Fixed Income portion of the portfolio. The holdings in this account consist of two bond funds yielding 3.52 and 1.64%. Why does a portfolio for a single 32 year old have over 25% invested in bonds? What is the point? What is your thinking? You generated an average yield of about 3% but gave up a 35% Dow gain (9/30/2011 – 6/30/2013) on $18,000. That’s one hell of an opportunity cost; about $6300. Both have net management fees of over 1.2% which includes a front end 12-b charge of .65% Both of the bond securities have deferred sales loads! That means that if the securities are sold in less than one year, the fund keeps 1% percent of the proceeds. After all the fees are deducted, the client will be lucky to realize a yield of 1.5%, tax free or not; it doesn’t matter much. Also in this client’s portfolio is a Variable Universal Life Insurance Policy. A Google search finds nothing good to say about Variable Universal Life Insurance. We do learn that the Variable Universal Life Policy typically earns the “advisor” a high commission. Here’s how it works for this client. He pays a $100 “premium” each month. $5.00 is stolen off the top for “Premium Expense Charge”. The remaining $95.00 is invested in the “VP-Moderate Aggressive” fund which itself contains 36 funds. The performance of the VP-Moderate Aggressive fund is less than half that of the Dow over the same time period. I suspect that there is a high management fee associated with this VP-Moderate Aggressive portfolio but it doesn’t show up. In addition to the $5.00 “Premium Expense Charge”, $28.00 is “withdrawn” from the fund each month to pay the “Cost of Insurance”. NOTE: A 20 year term life insurance policy for the same amount on a 32 year old male is $15.45 a month at State Farm. It’s hard to tell how well the portfolio is performing. I think there is only a one month (May) comparison period. The value at the beginning of May was $12,385 May added $12.52 to the account value (after deductions of $5.00 Premium Expense and $28.00 insurance premium) . Thus the account performance was essentially zero. In the same time period, the Dow was up over 1%. One month comparisons mean little however. It gets worse. Much worse. The value of the account is currently $12,469 but should the client want to liquidate the account, i.e. GET HIS MONEY OUT, the “Charge if Surrendered” is $1942 (16%)! This is bordering on criminal. This is unconscionable. Why does a healthy single 32 year old male need life insurance anyway? If Mr.Lentz was concerned that his client might become uninsurable in the future, then why not put him in a low cost term life insurance policy and invest the difference in index funds? Again the answer comes down to fees for Mr. Lentz and Ameriprise Financial. Variable Universal Life Insurance policies are notoriously higher cost than other forms of insurance. Putting a client into a Variable Universal Life Insurance Policy is not looking out for the client. It is presented as way to allow a client to invest “tax free” but whatever is saved in taxes is most likely eaten up in fees. And the client is locked in two ways – cash surrender fee and tax due on withdrawals. This is the “retirement” account consisting of a diversified portfolio of mutual funds. Every fund in the IRA is from the IVY family of funds. It is inconceivable that an Investment “Advisor” would come to the conclusion that the best funds he could find for his client just happened to be all from the same family of funds. And with a front-end load of 5.75% for every one of the funds, these funds have the highest front end load of any fund I have ever seen. This too is unconscionable and only serves the financial interests of the financial advisor. Let’s look at the performance of the account’s funds compared to the Dow (DIA). Because the Portfolio Progress chart starts with Quarter 3, 2011, I assume the account began at the start of the third quarter; i.e. July 1, 2011. 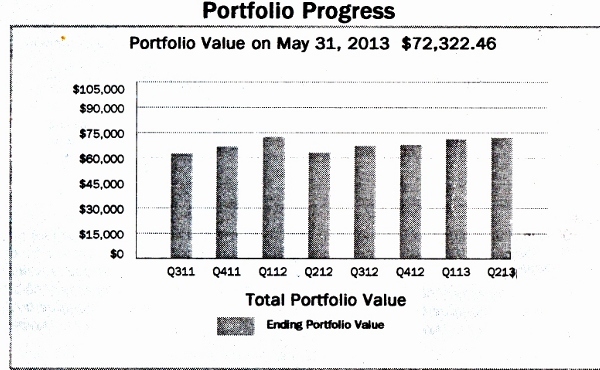 Amerprise Financial provides us with a summary of how the account fared over those years is shown below. Ameriprise themselves present the statistics. Per their own statement, the Unrealized Gain of this all-equity Diversified Portfolio is $6,290 and the Cost Basis is $30,109. The percent gain from 6/30/2011 to 5/31/2013 is 21%. In the same time frame, the Dow (DIA) increased in value by 21% too. Not bad. Their fund selections matched what the Dow did. But these comparisons are before consideration of the 6% reduction in the client’s investment money; front end load and 12b charge. The Account Holdings chart only shows the performance of the money that got invested. Only 94 cents of every dollar “invested” actually made it into the stock market. Six cents of each dollar went to front-end load. The table below shows the devastating effect on performance of a front end load. Click on Image to ENLARGE, back button to return. When the Front-End load and the totally unnecessary 12-b advertising fee of .25 are factored into the performance calculation, the performance falls to 13.6%! Now, if you include the $5K of idle cash into the value of the portfolio, the performance falls to 11.8%! Every one of the portfolio funds has a high turnover of the securities in its portfolio. This usually produces capital gains. The shareholder is responsible for paying the capital gains taxes. The DIA fund has no turnover and therefore, it’s owners do not pay capital gains taxes on it. The capital gains taxes that the client will have to pay – due to the fund managers’ churning of their portfolios – must be deducted from the 13.6% before we have a real number for comparison. Advisors who have done their homework know that small cap and value funds tend to outperform large cap growth and mid cap funds. Seminal research by economists Eugene Fama and Kenneth French, now referred to as the Three-Factor model, showed that over the long run small cap and value funds outperform more traditional capitalization-weighted indices such as the S&P500 in the United States. Two client-based on-line financial advisor frims, FutureAdvisors and Index Fund Advisors heavily weight their portfolios with value and small cap funds. Mr. Lentz seems painfully oblivious to these facts. This portfolio has $5K of CASH! This reduces the overall performance of this ROTH IRA account to 11.8% if it was in cash for the entire evaluation period; probably it was not. Probably the $5K was “invested” just before April 15 in order to qualify for the 2012 Tax status of a Roth. But, this report is for May. Why is there still cash in the account? For all this expert “advice”, the client pays $500 a year! To start…FORTY ONE PERCENT of this retirement account is in Cash or cash equivalents. With all the extra money paid for management fees, advisor front end loads, advisor $500 fee, you would expect the performance of the portfolio to far exceed the hum-drum performance of the plodding Dow Jones Industrial Average. It does not! No one but greedy advisors put their clients into mutual funds with high fees and front-end loads. Tom Lentz put his client into high fee, front-end loaded funds from a vendor with whom Ameriprise obviously has some arrangement. I find it hard to believe Mr. Lentz had his client’s best interests at heart. Further, he induced his client to buy what some see as the worst possible kind of life insurance, Variable Universal Life Insurance. Finally, he has 34% of the portfolio in Fixed Income. Not all financial advisors are as bad as Tom Lentz, but this is a sample of the dangers that you have to recognize and run from should you turn your portfolio management over to a financial advisor. Good luck or don’t trust luck – just buy VTI only.